"I was given some tiny fresh new potatoes from a friend's garden. I was grilling chicken and wanted an appetizer to throw on the grill. The bacon wrapped new potato was born. Serve with ranch dressing or BBQ sauce for dipping." Preheat an outdoor grill for low heat, and lightly oil the grate. Wrap each potato with a piece of bacon and secure with a toothpick. Sprinkle the potatoes with the powdered ranch dressing mix. 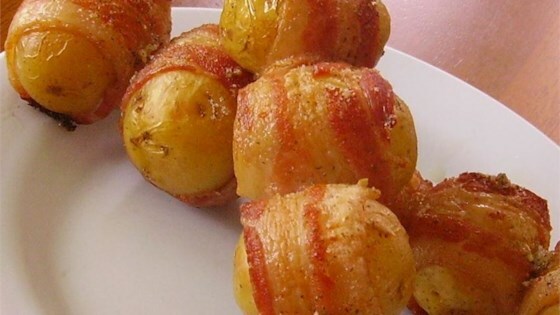 Place the wrapped potatoes on the grill, turning the potatoes several times to allow the bacon to cook on all sides. The potatoes will be done when the bacon is nice and crispy, about 20 to 25 minutes. See how to make cheesy potato rounds with crumbled bacon. These were DELISH! Everyone loved them. We used turkey bacon and wrapped the entire slice of bacon a round it. A little piece of heaven.